I seem to have an addiction to book covers. I'm always picking books to read based on covers. I am not afraid to admit that most of the time I add books to my TBR list based on the covers. I picked a few new covers this week to share. The synopsis sounds amazing as well. This one has a great cover. I'm curious to dive in. When magic returns, evil stirs. In the far north, a secret war between magic and technology threatens us all. Tortured by an accident that killed her parents, university dropout Cassie drifts, failing life. But Cassie is about to receive a miraculous gift, one that will thrust her onto the front lines in the battle for humanity’s survival. Alex is Special Forces. Highly trained and superbly motivated, now he’s been ordered to use those skills against the very people he’s sworn an oath to defend. Can he? Maelhrandia is a dark elf princess, the first of her kind to strike out at the pestilence that is humanity. A master of magic, she is power and death personified—and she’s not alone. 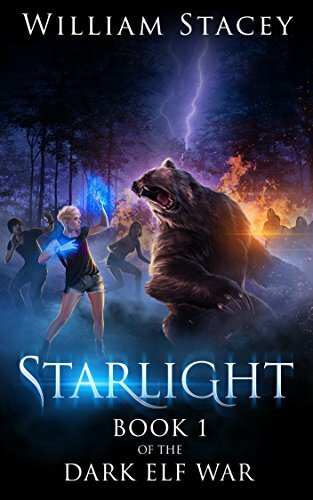 In the primeval forests of northern British Columbia, Cassie and Alex will fight alongside a covert Special Forces unit battling mythical beasts with supernatural powers in an undeclared war they can’t afford to lose. But will they recognize the true threat in time? It’s Black Hawk Down meets the Lord of the Rings in this action-packed new series that fans say they just can’t stop reading. Amazon best-selling author William Stacey is a former career army officer and author of The Vampire Queen Saga and Black Monastery, a 2014 Amazon Breakthrough Novel Award Quarter-Finalist.